When Pepper Roux was born his aunt foretold that he would not live past 14 years of age. Throughout his childhood his parents haven't bothered with him much, knowing that his life would be short-lived. So when Pepper wakes up on his 14th birthday he knows this will be the day that he'll die. But as the day wears on, and Pepper finds himself still alive, he decides to set off to sea in an attempt to try and avoid death for as long as possible. As time goes on Pepper steps into many roles and personas and has numerous outrageous adventures. But can he stay one step ahead of death? Or will fate catch up with him? And, if he does live, which of his many lives will he choose to adopt? This riot of a story is a wonderful adventure, and Pepper is an unforgettable character who stays with you long after his story has been told. 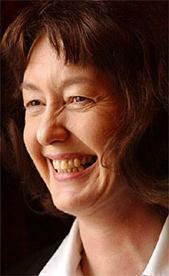 Geraldine McCaughrean was born in 1951 and brought up in North London. She studied at Christ Church College of Education, Canterbury and worked in a London publishing house for 10 years before becoming a full-time writer in 1988. She has written over 120 books, 50 short plays for schools, and a radio play. Geraldine McCaughrean lives in Berkshire. Her book, Not the End of the World, is currently being adapted for the stage.